That the weather has gone from bonkers to worse is a phenomenon we all could feel. It’s like the scheduled seasons have been pushed and the colder regions thus get much colder despite having very little snow. 🙁 I’m talking about Vienna to be exact. We’ve had very little snow this season but we’ve gone way past -10° — a first in 10 years. Although older neighbors would say that they have much colder than this when they’re younger and snow as high as 5 feet. So there’s not much time to go out and play in the snow like the previous years, here are two videos we’ve had in those days we were out to have snow fun and snow fights. This year, when we got snow for like 1 day in January and now for 3 days we savored it and went sledding…still not as much snow yet so chilly we could only stay for half an hour or less. Below is the most recent photo of the kids playing on snow. I had to make sure they are wrapped well before going out. How do you dress up for playing in snow? Here’s some tips on what to buy and what to wear to ensure that your kid/s and you are ready to battle the cold but still having fun while out there. 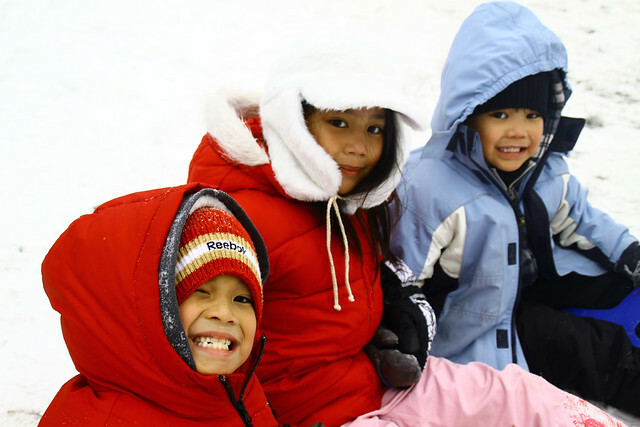 Not dressing up properly can cause frostbite or hypothermia and would totally ruin the fun whether it be backyard sledding or mountain skiing and snowboarding. Underneath. I’ve been used to having the kids wear a sleeveless undershirt that absorbs sweat easily. Despite the cold season I still make them do. A turtle neck or long-sleeved shirt made of polyester follows. Most of the time the boys wear long johns or long underwears, sometimes just the pants if they wear turtlenecks and it perfectly functions as thermal pants. Daughter puts on tights, I buy hers a bit bigger than her size because it tends to slip down from too much movement. Socks. Poly socks are the most comfy and won’t slide down from much movement…avoid thick socks cause they tend to be itchy if your feet heats up. Pullovers or Sweaters. Wool sweaters are best to really make one feel warm when outside. I tend to bring another one for each which is not as thick, mostly cotton-made so that when the sun shines and it gets sweaty, changing is easy. Ski Jacket and Salopettes, Snowsuit. For the outer garments as the ski jacket, make sure they are water-resistant, comfortable and not too fit. Remember that there’d be layers underneath so it will be hard to move if the jacket is tight. Down jackets though warm are not best suited for such because they tend to rip easily than those made from nylon. For the salopettes or skipants, make sure that the inside has a garterized extension under to keep snow from getting in. When buying consider allowance so that the shoes gets hidden also to prohibit snow and cold getting in. Snowsuits, worn as one-piece garment, I think is the best. It prevents cold the most since there is no room for air to pass through unlike when wearing a jacket and a salopette, air still gets in and can be felt from the torso and up. They however tend to be tight so buy one with allowance for easy movement. Boots. Like the above tips, get water-resistant boots. For skiing and snowboarding, there are specialized shoes that you can buy but for sledding outside, boots that are high enough and comfy would do. Padded boots are best to ensure you warmth, I also find them comfortable being padded and all. Scarves, neck gaiters and facemasks. My kids love looking like ninjas so when it’s cold they don’t really complain wearing facemasks. It’s the best garment to protect one from coldcheeks (what the kids call it when their faces turn red). Neck gaiters are a good substitute for facemasks too if you wear a bonnet or any other headgear so that you don’t sweat much, just pull it up and your nose and cheeks are covered. Wearing these two could be annoying though so we sometimes opt for scarves. Scarves are not ideal when skiing since you go on high speed but for sledding, just wrap it around the neck before putting in your sweater and you’re good to go. With a little technique you can cover part of the face with it too. Mittens, gloves, fingerless gloves. 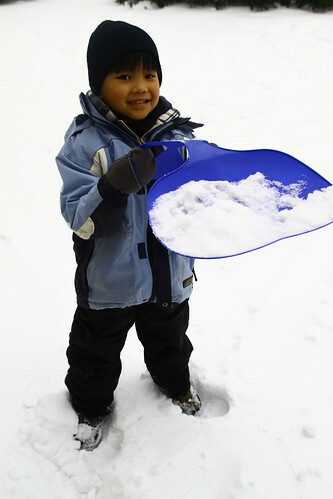 Mittens, gloves that do not have separate openings for fingers, are best for younger kids. It helps them hold on to things much easier unlike as adults who hold things better with just gloves.Never go out without any, the fingers are the most prone to frostbites and it could get really painful if left out in the cold. Trust me, even at 2° my fingers are freezing. Headgear, bonnets, earmuffs. Helmets are best to keep one warm and safe while sledding or skiing. They tend to be really warm too so make sure you have a bonnet to change with during a break. It is best to have bonnets that covers the ears well, if not, an earmuff over a bonnet would do. Goggles. Goggles or sunglasses are recommended when up the mountains. For sledding down the backyard, it may be just a cool accessory but goggles will also protect kids from any unseen flying stuff so if you have goggles, I suggest suit up and put them on. Enjoy the snow! One aspect that is so beautiful about humans is that no matter what, we’d be artistic. Even the walls of elevated train tracks gets graffitis on them, until now I don’t know how or when they do it. I do know though that snowboards are a unique way of expressing one’s self. You’d think it’s just a snowboard but hey, it’s like a car, why go with black when your favorite color is red, blue and purple? 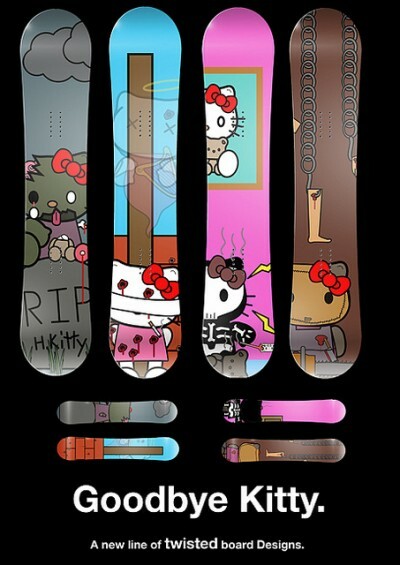 Put all these colors on and you have a cool snowboard compared to a plain white like the usual. Design options are endless…pick up your board and start designing…or have your hubby design it for you…like I would!